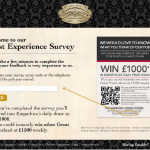 To know more and be a lucky winner, please go to www.nicholsonspubsurvey.co.uk. Visited the Philharmonic Dining Rooms for lunch during our city break to Liverpool. We were impressed with the ornate , unique pub and also with the service and lunch menu.Tom was particularly helpful and friendly.would recommend the beef and horseradish sandwich.